In July 2014, ‘The Steamie’ by Tony Roper was presented on location in the last remaining Glasgow wash house; Govanhill Baths. 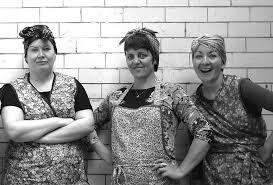 Tony Roper’s iconic play ‘The Steamie’ is a hilarious, often bittersweet, portrait of working class Glasgow in the 1950s. This touching tale centres around four women who have gathered at the local Steamie on Hogmanay, completing one last laundry load before the New Year. They share stories of men and mince, dreams and aspirations – with plenty of laughs along the way! Tears are shed as the women reminisce over a lost way of life; as steamies are rapidly becoming overshadowed by laundrettes and they realise that nothing will be the same again. Govanhill Baths houses the only remaining Glasgow steamie, and the Edwardian building itself provided a perfect backdrop to this production. Here, the original structure could still be seen, with a set which comprised of reproduction pieces and genuine features. The building is well-loved by locals, for many of whom the social issues at the heart of the play still ring true. The venue lent a special relevance to this production, drawing audiences from the surrounding area and far beyond.